Romeo has the most envied job, he serves ice creams to girls. Although he is not making much profit, he sure is winning their hearts. Let us help him with his job. Serve the girls as soon as possible to make them happy. There are flying kisses to be collected if you work real hard.Serve the girls fast to get their love and earn more money. Place the mouse near the sides or click the table or kitchen icons to scroll the scene. 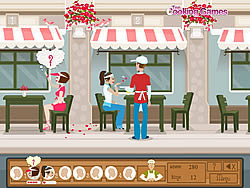 Click on the customers seated to move the Romeo there and get the order. Click the items icons to get it prepared, once it is ready on the table collect it in the tray and serve to the customers. Enjoy!